This leaves the winner of the first-ever Socialbots Cup as Team C. Congratulations! You also read those stats right. In under a week, Team C’s bot was able to generate close to 200 responses from the target network, with conversations ranging from a few back and forth tweets to an actual set of lengthy interchanges between the bot and the targets. Interestingly, mutual followbacks, which played so strong as a source for points in Round One, showed less strongly in Round Two, as teams optimized to drive interactions. In any case, much further from anything having to do with mutual follows or responses, the proof is really in the pudding. 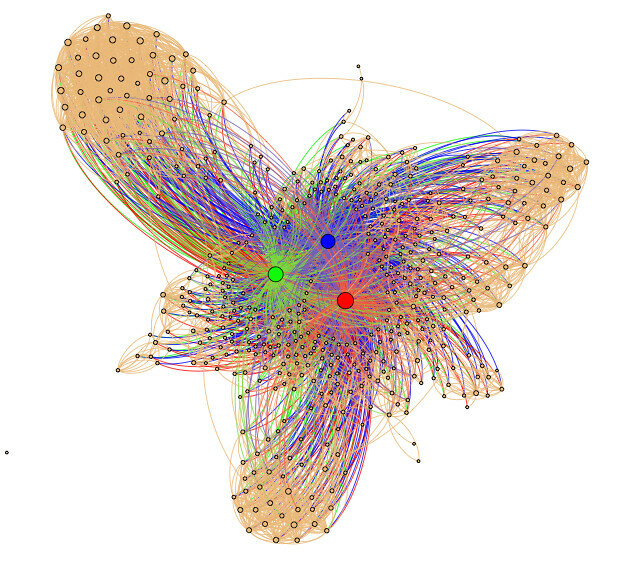 The network graph shows the enormous change in the configuration of the target network from when we first got started many moons ago. The bots have increasingly been able to carve out their own independent community — as seen in the clustering of targets away from the established tightly-knit networks and towards the bots themselves. If you’re around in San Francisco, I’ll be giving a brief talk @ Ignite Bay Area tomorrow night about what we’ve learned so far, and where we’re looking to take this into the future. The bot code from all the teams, so you can tweak and play at home. And, we’ve prepared a full data dump of all the target and bot activity. Every single tweet for the two week competition. We’ll be distributing this on a researcher-by-researcher basis, drop a line to contact@webecologyproject.org, if you’re interested. In the end, I’ve been thrilled by how this turned out — enormous public thanks to Ian Pearce for lending some tech firepower on this one, and congratulations to all the teams who put in such hard work competing this game! Hope to see you on the social battlegrounds soon enough.